Breast acne is more common than most people think, and it is often particularly common for women who have larger breasts. Breast acne, or acne that affects the breasts, often results in spots emerging under or on the breasts. Avoiding breast acne and treating breast acne is much the same as avoiding and treating spots that emerge anywhere on the body. Breast acne can flare up when women allow their breasts to become sweaty, trapped by tight clothing and/or are unable to thoroughly clean their breasts on a regular basis. To avoid breast acne in the first place women might shower daily and use anti-bacterial soap or a gentle anti-acne cleanser on their breast skin. These cleaning agents should be used both on the breast and on the skin surrounding the breast and under the breast. This will likely require lifting the breast to clean the skin beneath it. Women should also be careful to thoroughly dry themselves following a shower so that no excess moisture is left lingering on or near the breasts. If a towel does not dry this skin well enough then using a hairdryer on a very low setting might also be an option. Again, lifting the breast to expose the skin beneath may be required while drying. When women dress they should try to wear light, natural materials that allow air to circulate in the chest area. Bras that lift and separate the breasts should also be worn instead of constricting bras or sports bras. Sports bras in particular should only be worn while exercising since they are not usually made of breathable fabrics and they flatten the breasts which makes it hard for moisture to evaporate. Immediately following exercise a sports bra should be taken off and washed and a woman should shower away any excess sweat. 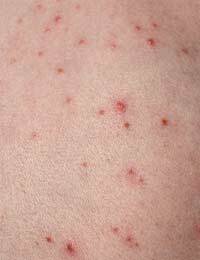 When breast acne does emerge it can be uncomfortable and it can look unattractive. Spots which are sighted should be treated immediately. Many over the counter acne medications may work to treat breast acne, including spot gels and acne treating pads. However, many of these treatments contain chemicals which could be harsh on delicate breast skin. Women should be sure to read all packaging to find out the recommended locations for using a particular acne treatment. Women should also consider looking for treatments specifically formulated for sensitive skin as these are usually more gentle than other products. Women who do decide to use such treatments on breast acne should watch carefully to make sure that they are not inflaming other skin around the spots, drying out sensitive breast skin or otherwise doing more harm than good. If breast acne becomes a recurring problem and a woman is unable to treat it at home, she should consider visiting her GP or a dermatologist for further advice and treatment options. There may be some prescription options for treating breast acne that she could try, or natural options that she did not know about. Discussing her lifestyle with a GP or dermatologist is also usually helpful so that she can best avoid breast acne in the future. My wife has got a big and hard pimple on her breast.The pimple doesn't get the mouth so pus will come out. To which doctor I'll go and how can we treat that.